Yesterday... more snow. 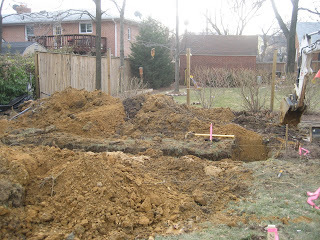 Today... a little snow in the morning but the digging began on the garage footers anyway. The holes will be inspected tomorrow and then the cement will be poured either Friday or Saturday. It's so great to see the tremendous progress that was made in only one day. The neighborhood kids loved watching the backhoe after school. You can see the clay in our soil in the picture at the right. The foundation foreman said that having clay is a huge help because the footers will be well supported. We moved out yesterday - across the street. Easy move and my husband supervised. He's still sore today so I'm thinking he did more than supervise! We are fairly settled in although there are still some mystery boxes that have yet to show up. I really need my step stool but cannot find it anywhere! It will probably show up when we move back across the street in 6 months! Fortunately it is generally still light enough to take pictures when I get home in the evenings so you should start to see more picture updates over the next few weeks.